Legitimately everywhere I turn there is another engagement. Friends from my childhood, friends I just met in the past year, heck, people at restaurants where I’m eating – it is the season of wedding engagements and DIAMONDS! I have loved getting to see pictures of all of my friend’s rings. Each of them are so unique and really match the person’s personality. It’s kind of amazing that everyone can have a diamond ring, and yet they are all so unique. Since my foreseeable future is going to be spent attending wedding showers, bachelorette parties, and weddings (I have four to attend in 2017 alone! ), I thought I would start brainstorming some cute ideas, and why not start with the rings? I used these same diamond shaped, silicone molds before to make rose wine gummies, and they were just too adorable to not use again. By just buying melting chocolates in any color of the rainbow you want (I chose pink, because duh. 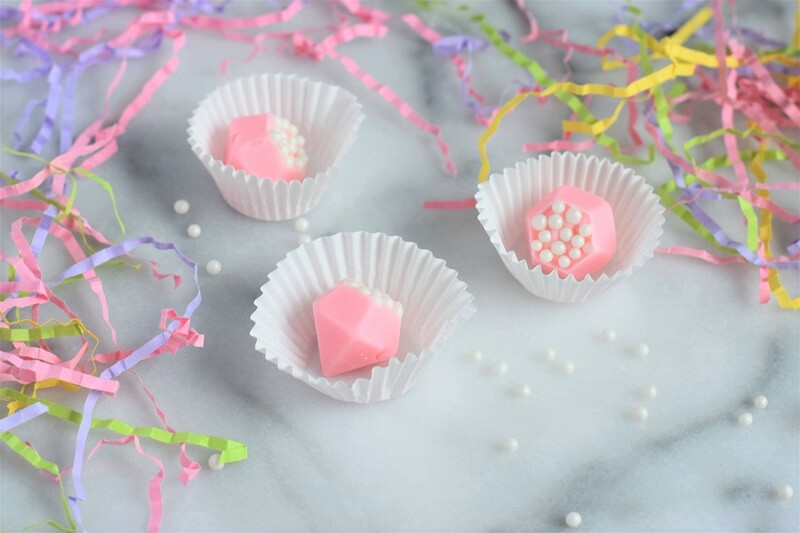 ), melting them down, and piping them into the molds, you can make these adorable little diamond chocolates! 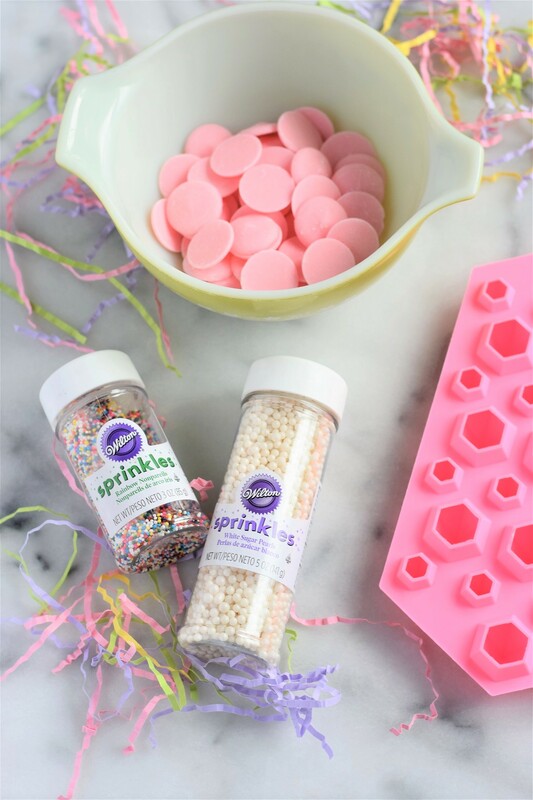 Top them with sprinkles and you have the cutest little gift. Are y’all as surrounded by wedding season as I am? I think it’s because my friends are all turning 26-28 years old this year and it’s getting people kicked into high gear thinking about being in their mid to late twenties. I’m so excited about all of the celebrations and all of the love! It’s coming at a really good time too, drowning out all of the political mess that consumes my social media usually, so I’m happily raking it all in! 1. Start by pouring half of your bag of candy melts into a microwave safe bowl. Microwave the candy melts at half power for 30 seconds. Remove the bowl from the microwave and stir. Continue microwaving the candy melts at 15-20 second intervals at half power and stirring until all of the candy melts have melted. 2. 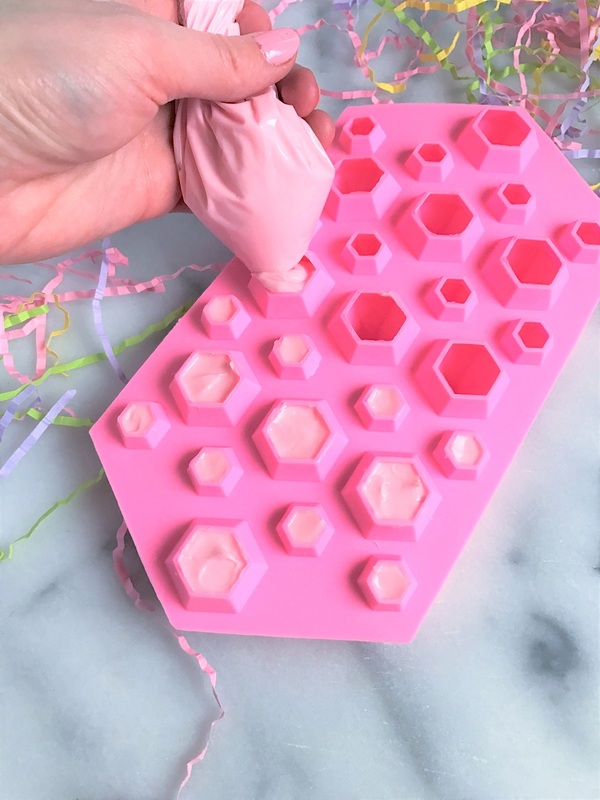 In order to fully fill the diamond molds with chocolate, you have to pipe the melted candy melts directly into the molds. 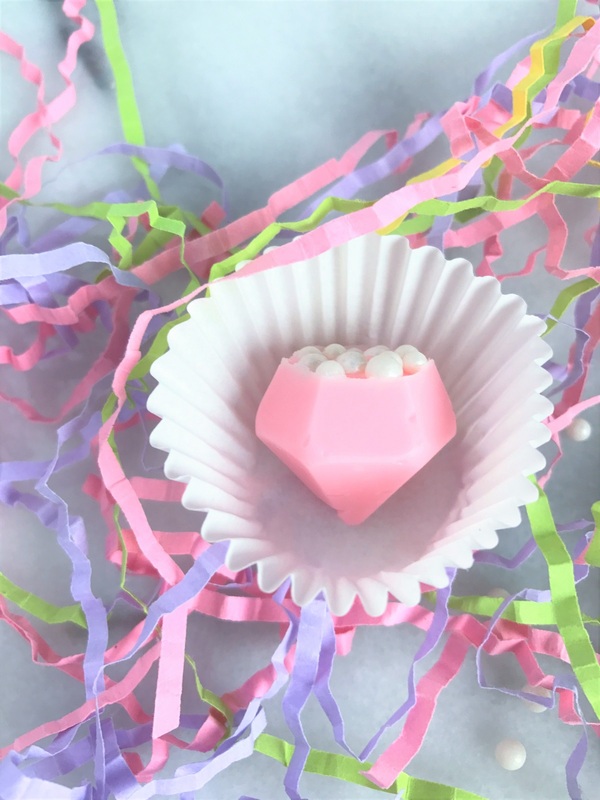 Pour the melted candy melts into a zip top bag or a piping bag, and snip the tip of one corner off so that you have a small hole. Carefully squeeze the chocolate into the molds. If you get chocolate outside of the mold, make sure to wipe them down with wet a paper towel so that you do not have lumpy diamonds. 3. 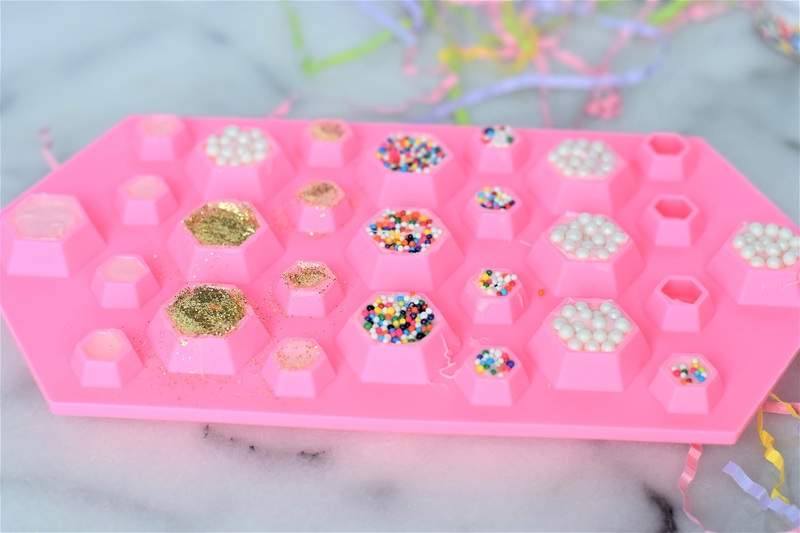 To finish your diamonds, sprinkle colorful sprinkles, candy pearls, or even edible gold dust on to the tops. Make sure to start with the diamonds you piped first since they will begin to harden quickly and you won’t be able to put any toppings on them. 4. Place the molds into your refrigerator for at least 15 minutes to harden. Carefully pop your diamonds out of each mold, and serve in mini cupcake cups or out on a plate. This should make about one mold’s worth of diamonds. these are so cute and glamorous! wish I had them at my pink and gold wedding! Omg they would have been so cute!! Thanks so much! I’m glad you liked it! I love your blog! These look so easy and fun to create! Thank you for posting!! So fun. I have a baby shower this Saturday I’m hosting! Want to try these!! Aw yes that would be perfect! I’m so glad you like them! 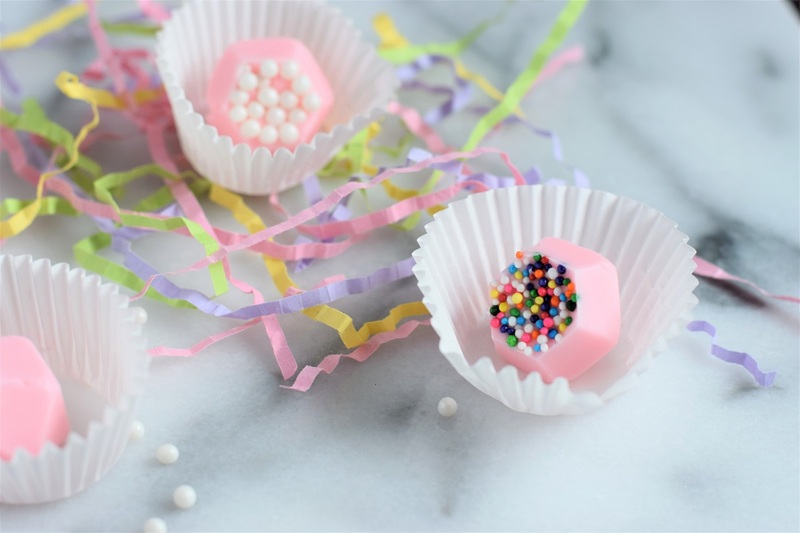 These would be the perfect adornment to any bridal shower – so cute and of course I love that they are pink! Yes that’s what I thought too! Will have to make them for my friends! Such a good idea! Those look so fun to make!